The other five photos will be presented later. Those who follow me on Farcebook or Instacrack have probably already seen them, but it’ll be nice to have them presented together in one place. Though small, this project has planted the seeds of other ideas in my brain that I look forward to exploring, nurturing some to fruition. With it now behind me, I have to say that the absolute bestest part of doing this particular shoot was opening that tin when it was over. It’s from the first production run in early 2003, a bit puffy, and more than a bit dusty. The aromas emanating as I pulled the ring and the pressure was released took me to another time and place, as did the first puff when I finally stopped sniffing it, filled the GBD, and lit up. 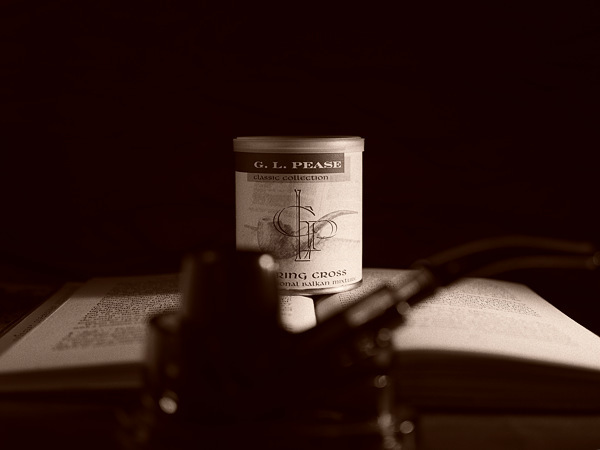 When I originally blended Charing Cross, I wanted the blend to recapture memories of countless tins of what is now vintage Balkan Sobranie — the stuff I smoked in my early days with the pipe, made long after Syrian latakia had been replaced by Cyprian, but before the transition to Gallahers production in 1982. Sixteen years later, how does it fare? Generally, I find myself smoking more recent vintages of my own blends, or the vintage tins of classic blends I’ve squirreled away through the years, which is why this tin and one other have survived until now. I’m rethinking that. With that first bowl, memories from the past sparked to life in an almost hypnotic way, inducing a state of pipe smoking bliss that went beyond the mere sensory pleasures of taste and aroma. And, for me, the personal satisfaction of knowing that I hit the mark with this one brings it to another level. It took 16 years, but the satisfaction was well worth the wait. Having now already smoked too many bowls of this, I have a feeling this tin’s contents won’t be around long. So it goes. There’s always that other one sitting there.